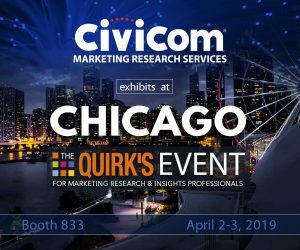 Leading global marketing research solutions provider Civicom® was an exhibitor at The Quirk’s Event West held in Chicago on April 2-3, 2019. The global leader showcased Glide Central®, an online media management solution for qualitative researchers. Quirk’s Events are annual industry expos known for gathering the market research industry in a quality, two-day event filled with rich and relevant learning and networking experiences for attendees. Experts from innovative brands big and small shared their best practices and breakthroughs in utilizing modern methods and the latest technologies in market research. Among the topics tackled by speakers this year included the adoption of digital approaches in catering to a rapidly evolving marketplace while also utilizing it to better understand and meet their demands. This year, Civicom promoted Glide Central, an online media management platform for qualitative researchers, alongside their suite of telephone and web-enabled market research solutions for insights professionals worldwide. Glide Central is designed to solve the organizational pain points of managing the overwhelming amount of audio and video generated during qualitative research studies, thus enabling market researchers to increase the delivery of insights to their clients. Glide eliminates much of the manual, tedious video curation process by efficiently streamlining every step within one platform. Researchers can view recordings, create tags, produce transcripts, make clips, and harvest key insights and accelerate their analysis and improve the turn-around time of delivering impactful reports. Civicom’s involvement in conferences such as The Quirk’s Events has allowed the global leader to collaborate with insights professionals in developing and delivering transformative marketing research solutions. Civicom Marketing Research Services offers many options to enhance the research process for marketing research professionals. Civicom is the global leader in facilitating telephone and web-enabled in-depth interviews and focus groups using Civicom CyberFacility®. Civicom also offers Civicom Chatterbox®, an asynchronous research platform for online communities and bulletin boards, plus the Civicom ThoughtLight™ Mobile Insights App, a mobile qualitative tool for collecting richer in-the-moment insights, useful for shopper insights, audio diaries, and patient journeys. Civicom operates in over 96 countries and offers extensive translation services for marketing researchers, as well as transcription services through TranscriptionWing™, and market research respondent recruiting through CiviSelect™. Civicom developed CCam focus®, a portable 360° HD streaming solution with video curation capabilities for live, in-person focus groups, which enables market researchers to stream in-person interviews and focus groups as well as from outside-facility locations such as a hotel, conference room or a home. With 360° perspective, crystal clear audio and integrated video curation tools, CCam focus ensures every response is captured and video deliverables are efficiently generated within minutes for closer review of key moments. The result is no bad seat in the house for omnidirectional viewing of all participants. Civicom also provides personalized service and support for set up, troubleshooting and additional assistance throughout every session. Civicom Marketing Research Services and Schlesinger Group have now partnered in a Strategic Alliance to mutually serve the needs of clients needing web IDIs and focus groups combined with high quality recruiting services. All of these services are available in Spanish, as well as English, and multiple other languages. Civicom Marketing Research Services chooses to be as dynamic as it is innovative; always listening to and acting on clients’ ideas and requests as they see fit. This kind of relationship has paved the way for the development and roll-out of new services. To learn more, email Civicom® at inquire(at)civicommrs(dot)com or call +1-203-413-2423.